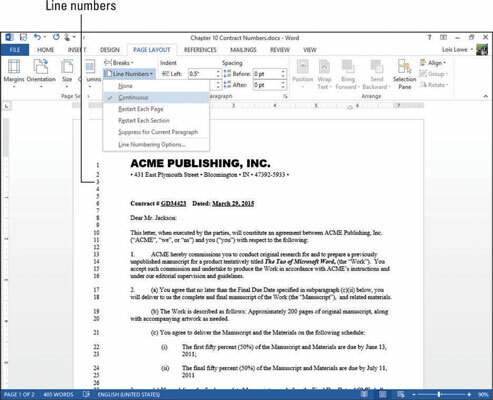 Line numbering, if enabled, appears to the left of each line that contains text in your Word 2013 document. All lines are numbered except those in tables, footnotes, endnotes, text boxes, headers, and footers. You can choose to number every line individually or choose to display line numbers at intervals, such as every tenth line. Open a Word 2013 document in need of line numbering. As you can see, there are several different line numbering options you can choose from to enable for your document. 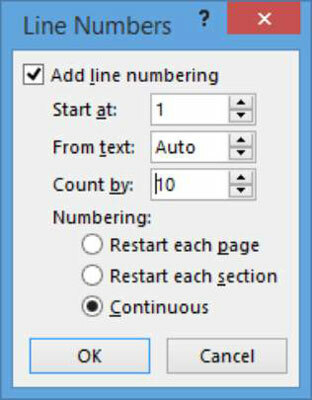 Pick the line numbering option that meets your needs, continuous, restart at each page, restart at each sections, or even to skip numbering a certain paragraph. Blank lines created by pressing Enter are numbered along with other lines. However, blank lines created by applying extra spacing above or below a paragraph, or blank lines in between the lines of a double-spaced paragraph, are not numbered. Notice in the image, for example, that lines 3 through 5 are blank numbered lines, and the extra line of spacing between lines 16 and 17 is not numbered. Choose Page Layout→Line Numbers→Line Numbering Options. The Page Setup dialog box opens with the Layout tab displayed. Click the Line Numbers button. The Line Numbers dialog box opens. Change the Count By value to 10, click OK to close the Line Numbers dialog box, and then click OK to close the Page Setup dialog box. The lines are now numbered every ten lines instead of every line.